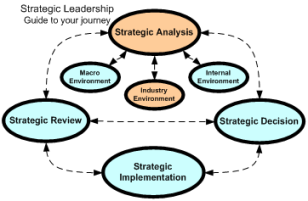 The industry environment analysis is traditionally the second stage of your strategic analysis its purpose is to determine the level of competitive pressure your business is likely to be exposed to in the foreseeable future. As a good leader you will need to understand the forces at work in your industry environment and have considered your possible responses to identified opportunities and threats. For example: If you are a generic timber furniture manufacturer and you sell exclusively to one large retail outlet. The buyer of your products will probably have considerable power in the relationship, as it would be easy for the retial chain to switch to one of your competitors products. Further there are limited barriers for new manufacturers to enter into the generic timber furniture manufacturing industry – there could be any number of eager start-up businesses anywhere in the world that might try to influence your customer to buy from them. And …. Your customer could chose to start-up their own furniture manufacturing business (Vertically integrate) eliminating the need for them to buy from a furniture manufacturer altogether. All of these industry factors place you and your business under considerable price pressure. As a strategic leader you will need to gain and maintain a thorough understanding of the nature of your industry and use this knowledge to position your business to minimise the effect of the competitive forces in your industry. In addition to leading/navigating your business to a successful future you, as a strategic manager, will also be able to apply your industry knowledge daily to motivate staff and build company spirit. The industry analysis guideline below will empower you to be a great leader; even a great strategic leader. Note: A key difference between strategic planning and strategic thinking is that strategic thinkers are continually tuned in to the industry environment, making alterations to the business strategy as new opportunities and threats are identified. An industry environment analysis can be brainstormed or completed on your own – though brainstorming with a cross section of people in your business can be very fruitful. 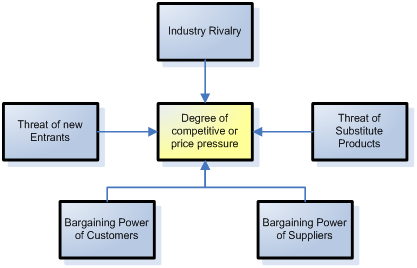 Porter’s five forces model consists of five forces that impact the level of competition in your industry, for each force there are a set of questions you can ask about your industry to help you to gain an understanding of the key competitive forces likely to affect your industry in the future.